There’s a subtle difference between module presentation and module design. As a freelancer, I spend a lot of time obsessing over module design. As a publisher, I spend just as much time obsessing over the layout and presentation of the module. I fit in game prep. around my busy life. I don’t want the game prep. to take longer than the actual game. I don’t have an encyclopaedic knowledge of the rules. I want to make the game as awesome as possible. No Stat Blocks: I understand the tyranny of word and page count. I do. But it irritates me beyond belief when the module doesn’t actually present the stat blocks for the monsters appearing on its pages. I would happily pay twice or three times as much for a larger module including all the stat blocks. My time is worth more. To me, it doesn’t really matter if it’s is a bog-standard monster like an orc or an odd creature from some optional source. Include the stat block. (I particularly like encounters with multiple monsters whose stat blocks appear in different books). At the least you are forcing me to drag another book to the game (what luck I have infinite space behind my beloved GM screen) or I’m wasting time printing out a stat block or downloading a version to my shiny idevice. Time I could better spend. No Monsters in Room Descriptions: Gah! What is it about room descriptions and monsters? In many instances, it seems a room gets a lovely detailed description. Perhaps the designer lavishes great care and detail on describing the wall hangings, furniture or other features but neglects to mention the sodding great monster charging toward the party! I genuinely don’t understand this. If you’ve got—say—an ogre with a falchion charging you, you’d probably spot that over—say—the fascinating design of the inlaid floor mosaic. Sure, the designer should mention the mosaic (or whatever) but the ogre is probably of greater, immediate interest to the PCs. In a classic example, in the module I’m running at the moment we get a lovely room description followed by a long paragraph detailing the room’s purpose and history. At the start of the third paragraph, we discover there is a disembodied head of a Large-sized monster floating in the room (which will attack the PCs). Should the large, brightly coloured floating, disembodied head not be mentioned in the room description? Badly Organised Text #1: Ah, the dreaded wall of text. What—for the love of god—is wrong with sub-headings and bullet points? This isn’t the 1970s. Even the most basic word processing package available today has features the designers and layout team could only dream of at the dawn of the hobby. My revolutionary suggestion is for publishers to make it easier for GMs to prepare and use modules by breaking up the text. GMs—like everyone else these days (seemingly)—are time poor. Remove some of the stress from GMing—make the modules easy to use. (And as an aside here, I loved WoTC’s solution to this—the tactical encounter spread. Sure they didn’t get it 100% right, but I loved the idea and have used a modified version in all Raging Swan Press’s modules). Badly Organised Text #2: When you layout an encounter, how about considering the order in which the GM will need the various pieces of information? Group relevant pieces of information together. Information critical to running the encounter should come first. Optional information should come last. And by optional information, I mean that which is nice to know for the GM (perhaps a detailed description of the NPC’s motivation) but which a GM in a rush doesn’t absolutely need. In a recent encounter I prepared, we had text in the following order: read aloud paragraph, paragraph of ancient backstory, the trap, paragraph of recent backstory and—finally—the clue the PCs need to proceed in the correct direction. It was literally the last sentence of the encounter. Baffling. 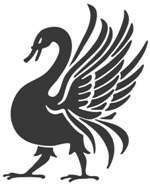 Give-Away Cover Art: At Raging Swan Press, we are famed—or perhaps derided—for our basic covers. I’ve gone on at great length before about why we don’t use cover art. That said, art is pretty and makes books look cool. But here’s an idea: if you are going to use artwork on the cover don’t use a piece that ruins the players’ enjoyment of the module. For example, if the adventure climaxes with the PCs fighting a dragon amid the frigid waters of a subterranean lake don’t show this on the cover. It’s a bit of a giveaway. Bad Colour Choices: I’m colourblind (as are roughly 10% of men who make up the majority of role-players). I’m not trying to get your pity, but being colourblind can make running an adventure harder depending on the colour scheme of the module and/or its maps. Of course, sometimes you have to use certain colours—a yellow forest would look odd—but if you have the option during layout don’t use colours that colourblind people regularly have problems seeing. The classic, but slightly off-topic, example for me of this was WoTC’s use of colours to highlight the various powers in 4e—green (at-will powers), reddish brown (encounter powers) and grey (daily powers). If you didn’t know, green, red and brown are the colours that people most regularly can’t differentiate. Well played, WoTC. 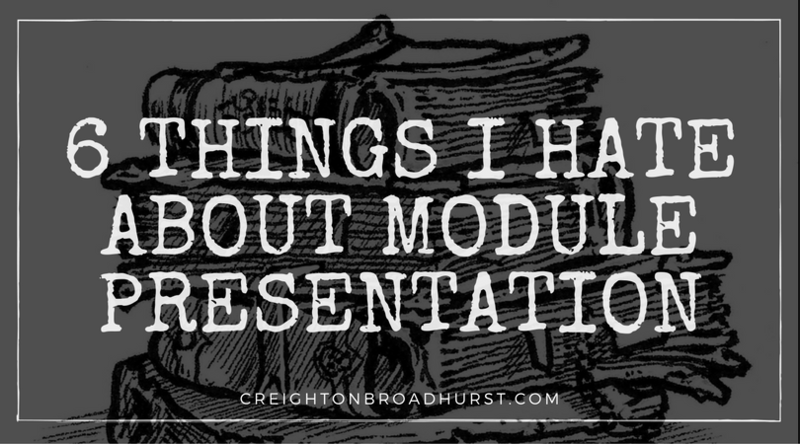 What else bothers you about module layout and presentation? Let me know, in the comments below. Not only will you give me more things to rant about, you’ll help me make my own module layout better! I’d like it if the modules came with a map file link you can type in your code of purchase download the map, 1″ square or hex etc. size scale map to use with D&D minis. Print out from home on regular paper tape or glue the pages together or go to Staples, Office Depot, Kinko’s etc. have it printed & laminated if you wanted to. That would greatly speed-up prep time I feel. A great and needed article, Creighton; I agree with every point, particularly 2, 3, and 4. There is a seventh aggravation you addressed lightly inside your points as well: filling an adventure with backstory that the PCs will never discover. It amazes me that, with the tyranny of word counts, so many modules contain oodles of lovingly crafted history that I love reading in campaign setting material, but that my players can’t discover while adventuring, and honestly could care less about anyway because, you know, there’s stuff to hit with their make believe axes. I would much rather have that history whittled down to only what is important and transferable to the adventurers. I imagine doing so would allow most modules to contain all of the stat blocks for the adventure. Ken–I also hate the long and Monstrous Backstory of Irrelevance (unless the PCs can actually learn it). I think a lot of designers seem to forget that its not a novel–it’s an adventure which needs to be written differently. Great criticisms. I will definitely keep these in mind when I am writing my own stuff. Nice Forge of Fury reference. I despise read aloud text. It takes up valuable space, omits something important like the monster in the room and is better laid out as bullet points. It is not 1981. I agree 100% on back story. It NEEDS to be discoverable or it is wasted word count. Some of these aren’t as big a deal for me as all my recent gaming has been online, so having access to other resources and time to look through things is not that big a deal. I do agree with #1 when it comes to NPCs. I can go look up troglodytes or dire wolves, but saying someone is a monk 4/fighter 2 is not helpful. I have time to find stat blocks, but not to make them myself. I also think room descriptions should include monsters. That should be the first thing you notice. I usually wouldn’t even describe the room in detail until after the encounter is over because who would focus on something like that when you are fighting for your life? Also, I was curious about your take on no art covers. Could you share a link to where you’ve discussed that here? Turns out, I can’t find the article I was sure I’d written on this subject. This gives me a perfect excuse to whip one up! Relating to no. #1, I have one that aggravates me as well, and that’s the overuse of different books in the same module. I did a count on a recent module I GM’ed, and it referenced 10 different books, 5 for monsters, another for a template 2 for gear and spells and 2 more for NPC stat blocks. I understand that the company wants to sell me stuff, but how am I going to take 10 different books with me for a game? And that doesn’t even include the module and all the accessories. I get that I could use a tablet or laptop, but I don’t like electronic devices at the table. They cause people’s attention to wander. I feel your pain. I don’t mind a monster (or whatever) appearing in a module if there’s a decent reason for it doing so. If however, it’s just there because either “it’s cool” or the designer clearly just got a new book I’m less fine with it. Here’s a pet peeve of mine: a module that fails to give a concise summary of what it is about, who it is for, and a high level outline of how the action is expected to unfold. It is frustrating to pick up a module you are considering, only to find a five page introduction that starts with a background story, then leads into the current situation, and then ends in some encounter or dialog that is supposed to hook the players into the adventure itself. Reading a story without any context always makes my eyes glaze over. Fifteen minutes later I am bored and I still don’t know what the module is about, and I’m already at room #1. I go back thinking I missed it, read it again, and still nothing. Worse, the history and story does not match my established campaign so I have to discard it all anyway. I end up having to read the ENTIRE MODULE just to see what it is even about, only to realize my party is not the correct level, or it has the wrong sort or plot, or it is too long or too short, or whatever. And without an overview I have to read it several times just to figure out how the action proceeds, as the little connecting clues are often buried in a read-aloud boxed text, a line or dialog, or a room description. It’s almost as if the designer want to impress me with how obscure and indirect he can be: look, I led you through a module and you jumped through all the hoops without realizing you were doing it! That’s fine for players, but NOT for the GM, and in any case its the GM’s job to do that, not the module designer. This module is a dungeon crawl for 5 characters of 6th level. It starts in a forest village, where a dying prisoner whispers the location of a fabled book in a dungeon. To reach the dungeon, the party will cross a fairy forest and a witch will stalk them. They come to a dungeon in a cliff, and descend four levels to an ancient library. The adventure mainly features kobolds and puzzle-traps, plus a kingdom of treacherous morlocks. The boss is an illithid lich with an army of undead myconids. The adventure should take 2-3 sessions and is not very deadly, but potentially changes everyone’s alignments. The myconids will probably take over the forest even if the party defeats the lich, leading to the second module of this series, “The Myconid Menace”. That is useful! Yes it has spoilers, but players shouldn’t be reading it anyway. If I hate morlocks I can change them to goblins or something. If I need a city adventure or my party is 1st level I can stop reading, or save it for later. If I am looking for a quirky dungeon crawl in a forest, sweet! That sort of concise description is like a block diagram at the start of a technical document, or the map at the front of a fantasy novel, or the itinerary of a transcontinental flight. Without it you have to read the module several times to tease out the clues. With it, I can browse through the adventure and know how everything fits into the whole, and how to dissect and modify it to fit my campaign and my tastes. This is a great point. I’ve actually not purchased modules before because I literally couldn’t work out from the cover blurb what level they were for. I don’t understand how any publisher could leave this information out! I actually do not like the sheer volume of lavishly illustrated material. Books have heavily textured pages, full colour art throughout, and a cover that is often devoid of art, but when it isn’t it contains a violent scene of superhero combat and action that I personally cannot wrap my mind around. For an illustrator, this may seem like a strange aesthetic for me to have, but personally, I would love to have a colour cover that does not involve some crazy action (rather, a more realistic action, or a cover that alludes to action and actually tells a story) and is filled with black and white art and black and white maps. I do not like colour maps overall. Strangely, though, I love the maps from the old MERP books, and they were in colour. I find a lot of modern design overwhelming. Less is often more and allows for more imagination on the part of the players and DM. “Less is often more…” Wise words and my sentiments exactly! I’m not sure I understand the underlying complaint of #4. When I write an encounter, I assume the GM will read the entire text (at least that section) prior to play. I attempt to group the info most pertinent to the game session together- at the end. I try to set it up so the GM can take a glance at the last paragraph of that section and find DC checks, and basic tactics. Immediately following that paragraph is the reference list of stats, treasure, and story awards. That info isn’t scattered all over the section, but it is at the end. I guess I’m asking if having the pertinent info scattered throughout the text is the problem, or if you think the section should be front-loaded with the logistics? I think when writing or laying out an adventure, the designer (and layout supremo) should assume the GM is tired, distracted (by player questions) and prepared several days ago (probably not as thoroughly as he’d like). Thus, critical information should be clearly signposted. Like in Jame’s comment above–if a room’s door is stuck or barred so so at the beginning of the text not toward the end. Basically, assume the worst case for a GM running the adventure and design for that. Make it easy to run. What do you think about placing the stat blocks and additional map appendix in the back of the module and just having an encounter reference block inline to the story? That is what I prefer because it makes it easier to print pages x to y during prep than wasting ink on the obligatory interior art that is bound to accompany key monsters or characters inline to the story. If you’d asked me this a year ago, I would have said I’m very much against the practise. However, now I’m warming to it. I’m contemplating converting some of our old modules to 5e and switching about stat blocks is going to play hell with the layout. Having them all at the back, would make it much easier–however, I’m not sure which approach is right for people actually running the adventure. Propper prepping takes so much time. I had such a discussion over at the Paizo boards. Short answer: a lot of the customers seem to enjoy to only read the module. Even my statement, that this is a roleplaying product and should therefore care for GMs in the first place didn’t seem to hit a nerve. Anyway. What I hate most is, as you said, those monster-neutral room descriptions. Who cares what kind of furniture is in there, when a bearded devil is waiting to kill you?! And after the read-aloud text, you normally get some other (at that time) unnecessary information before the creature-part starts… I hate it. I know, wordcount is a thing in the industry, but oh boy, I would love to have my Paizo APs and modules with that sidebar (like Monte Cooks products) where it would be easy to give rules info about conditions, etc. PDF Expert is an awesome iPad App, which helps me out in so many ways during prepping and GMing. I highly recommend it! I’ve just started using PDF Expert. You are right-it is excellent! I assume later Paizo adventures also start referring to Bestiaries 4,5 etc. ad infinitum. The assumption seems to be that we should just look things up on the Pathfinder SRD as needed. Those of us who like to game using actual books are not being catered for.